Milford, NH – November 23, 2011 – Coldplay’s current massive world tour is using a number of Earthworks microphones. Their live sound engineer Dan Green recently auditioned a number of Earthworks microphones from UK distributor Unity Audio, specifically for drummer Will Champion’s kit. “Since moving to the Earthworks drum microphones my drum sound has really expanded. The transient response of these microphones is incredible. Before I used to rely on transient enhancing plug-ins to get a similar sound, now it is all from the SR40 overheads. One of the other benefits of the new DP30/C periscope microphones are their new very rugged flexible arms, this gives me so many options on placement. They are a great addition to any Studio recording or Live performance.” Dan Green – Coldplay FOH engineer. The full complement of drum microphones includes, SR40MP (matched pair) for overheads, SR30/HC for kick and hi-hat, including the Earthworks KickPad™ for the kick mic, 5x DP30/C drum periscope mics for snare top & bottom, and all toms. Dan also took the opportunity to test Earthworks new SR40V hand held condenser and ordered several for backing vocals and the industry standard M30 measurement microphone for analysing PA systems. 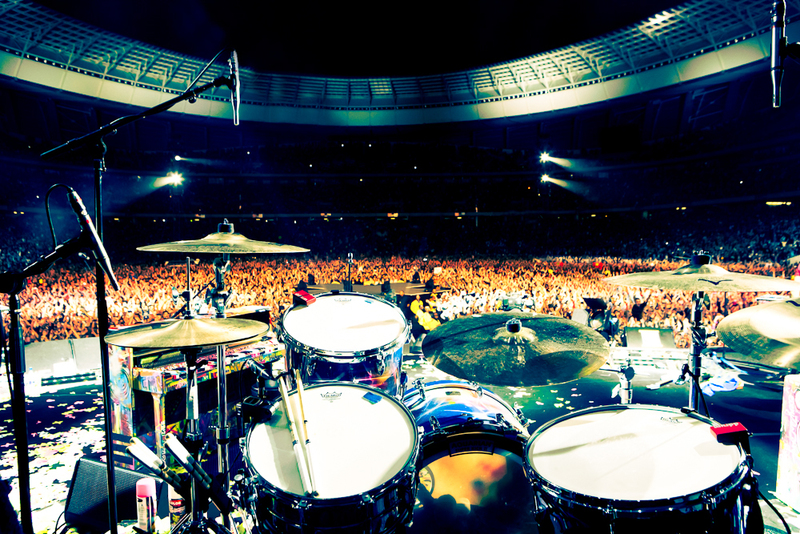 Coldplay’s use of Earthworks drum microphones now is in addition to other international artists such as Steve Gadd, Keith Carlock (Steely Dan), and The Killers. Earthworks offers complete drum mic kits with the 3-piece DK25 and DK50 Series for live or recording, as well as the CMK CloseMic™ Series and DFK Drum FullKit™. Any of these microphones can also be purchased individually. The small diaphragm Earthworks microphones boast the flattest frequency and fastest transient response available, coupled with an unrivalled 15 year warranty.